In-house Bloodwork - Veterinary Medical Ctr of Lebanon, Inc.
We run most bloodwork in house so you can have results the same day in most situations. 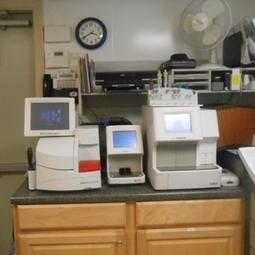 We can perform complete blood counts (cbc), chemistry profiles, clotting panels, thyroid checks, and much more. Stool samples to check for parasites as well as urinalysis for bladder infections are also run in-house. Cats can be tested for feline leukemia, FIV, and heartworm disease. Dogs can be tested for heartworm, lyme disease and other tick-borne diseases. For tests unable to be performed in-house we utilize our outside lab.